European football's governing body is preparing to relax the Financial Fair Play (FFP) rules it introduced in 2011 to stop clubs from overspending. 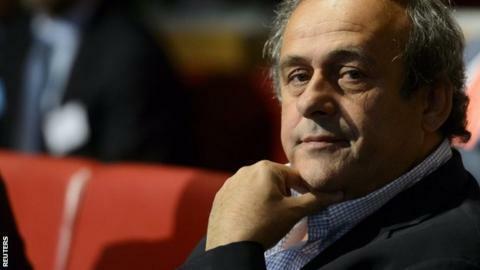 In an interview with French radio station RTL, Uefa president Michel Platini said FFP was "working well" but would be "eased" this summer. This followed a report in Le Parisien newspaper on Sunday that said "significant changes" are on the table. Manchester City and Paris St-Germain were fined last year for breaching FFP. Platini's right-hand man at Uefa, general secretary Gianni Infantino, later confirmed to the BBC that talks about FFP with Europe's leading clubs were "ongoing", with a "number of amendments" under discussion. "Financial Fair Play has proved successful in achieving considerable improvement in the financial health of European football," said Infantino. "Aggregate net losses of Europe's clubs have fallen from 1.7bn euros in 2011 to 400m euros in 2014. "Regular review of the regulations is vital to ensure they keep pace with the ever-changing football environment and the new challenges that this often poses. "Any potential changes will look to encourage more growth, more competition and market stimulation while strengthening the emphasis on controlling spending and safeguarding financial stability." The guiding principle of FFP is that clubs should stay within their means when it comes to buying and remunerating players: central to this is the so-called "break-even requirement". The rules have been phased in to allow clubs some leeway but many have struggled to stay within the criteria and several have been given sanctions that range from bans on registering new players, fines and even exclusion from European club competitions. But criticism of FFP has grown over the last two seasons as many observers have pointed out that stopping clubs from spending more than they earn cements the status quo - without the ability to speculate with their own money, ambitious owners of smaller clubs can never compete with more established clubs for the best players. Platini did not go into details with RTL, saying only that the clubs had voted for FFP in the first place but Uefa's executive committee was likely to revise them by the end of June, when it meets in Prague. But he also alluded to French critics who say FFP has made it very difficult for Qatar-owned PSG to join Europe's elite, a position fans of Abu Dhabi-backed Manchester City share. "The French press say it is not right that [Chelsea owner Roman] Abramovich can buy many players and in France they cannot buy them," he said. "But if the Qataris had bought AC Milan, the French would also say we should make financial fair play even tougher. As it is, the Italians wanted it eased. "The world is two-faced but we will say this openly: I think we'll ease things." The article in Le Parisien went slightly further, suggesting the changes were a reaction to the "multiple legal actions (against FFP) currently in process, some of which are nearing conclusion". Those legal actions are being spearheaded by Belgian lawyer Jean-Louis Dupont, who forced Uefa to overhaul its transfer rules with the Bosman Ruling in 1995. Originally acting on behalf of a football agent, Dupont's challenge to FFP has now attracted support from fans of Manchester City, PSG and other clubs. Dupont maintains FFP is contrary to basic European Union rules on free markets and he has filed complaints at courts in Brussels, Paris and Switzerland, as well as with the European Commission. "We welcome the announcement of a change in the rules in line with the demands expressed by our clients in their various legal actions," Dupont said. "When the exact content and scope of these changes are known, we will consider how this development, which on first sight appears favourable, is likely to meet their legitimate expectations and influence the conduct of ongoing actions." A spokesman for the European Club Association, the body formed in 2008 to replace the G-14 group of elite clubs, confirmed it has been involved in talks with Uefa since December, those talks continue and a final decision was likely by the end of June.